1. Preheat the oven to 200˚C, gas mark 6. Use a mandoline or vegetable peeler to pare the courgettes into long, thin strips. Toss with the oil and season. Put the flatbreads on a baking tray and bake for 8-10 minutes, until golden. 2. Meanwhile, set a griddle pan over a high heat. Griddle the courgette strips in batches on the smoking hot grill, turning with tongs after 30-60 seconds, or once marked with griddle stripes. 3. Mix together the garlic and yogurt; season. 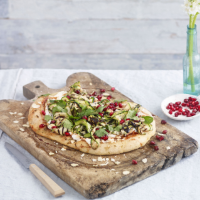 Spoon over the baked flatbreads and top with a tangle of griddled courgettes, followed by a scattering of toasted flaked almonds, pomegranate seeds and chopped coriander leaves. Finish with a drizzle of pomegranate molasses and a few grinds of black pepper. This recipe was first published in Sat Jul 01 11:36:43 BST 2017.